18 Jan 395 Part of Eastern Roman (Byzantine) Empire. 924 - 931 Bulgarian occupation. 997 - Mar? 1018 Part of Bulgaria. Mar? 1018 - 1071 Byzantine rule as the theme of Sirmium (Sirmíou). often referred to by historians as "Raška/Rascia"
1126 Under Byzantine suzerainty (by force). 8 Aug 1217 Serbian Kingdom (by papal coronation). 16 Apr 1346 - 3 Dec 1371 Serbian Empire, main capital at Skopje. disintegration of the Serbian state. 1390 - 18 Aug 1439 Serbia an Ottoman vassal. 17 May 1395 Ottomans annex Velbužd and Prilep. Jul 1427 - 29 Aug 1521 Belgrade part of Hungary. 18 Aug 1439 - 12 Jun 1444 Ottoman occupation. 29 Aug 1521 Ottomans annex Belgrade. 1594 Serb rebellion (Banat uprising). 1597 - 1598 Serb rebellion (Grdan's uprising). 6 Sep 1689 - 10 Sep 1691 Austrian occupation. of Serbia (Königreich Serbien) within Austria. 9 Feb 1778 - 7 Sep 1778 Serb rebellion (Koča's Krajina rebellion). Aug 1789 - Sep 1791 Austrian occupation. 21 Sep 1813 Ottoman rule restored (New Style 3 Oct 1813). dates 23 Apr 1815 - 26 Jul 1817). 1815 and 6 Nov 1817). Ottoman suzerainty)(New Style date 12 Dec 1830). 1831 - 1833 Expansion of Serbia southwards to Kruševac. (Old style date 6 Apr 1867). ratified 3 Aug 1878/22 Jul 1878). 6 Mar 1882 Kingdom of Serbia (Old style date 22 Feb 1882). 2 Dec 1914 - 15 Dec 1914 Belgrade occupied by Austria-Hungary. (in Vranje to 5 Oct 1918, Niš to 11 Oct 1918). (Old Style date 18 Nov 1918). 29 Dec 1918 Parliament of Serbia approves act of unification. [Banate of the Morava], and City of Belgrade). Pomoravlje (subordinate to German forces). 20 Oct 1944 Belgrade is liberated. 29 Nov 1945 Part of Federal People's Republic of Yugoslavia. 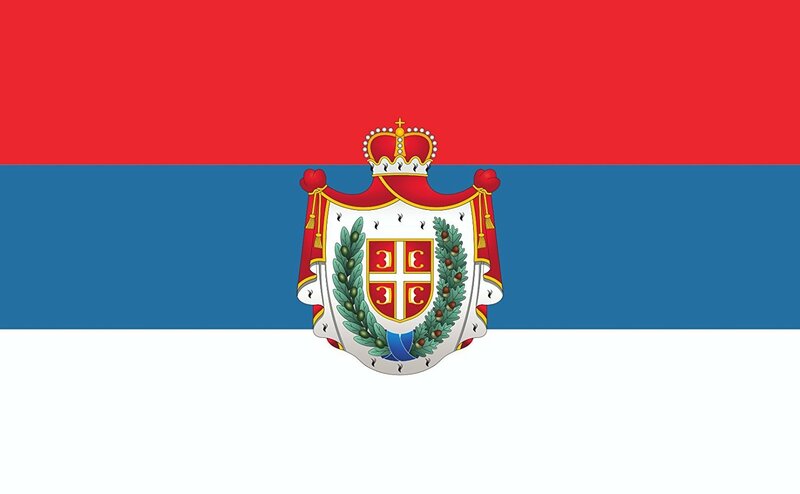 31 Jan 1946 People's Republic of Serbia (within Yugoslavia). 7 Apr 1963 Socialist Republic of Serbia (within Yugoslavia). 28 Sep 1990 Republic of Serbia (within Yugoslavia). union, declaring itself its legal successor. Note: Serbian transliteration based on the Roman equivalents as used for Croatian and Slovenian and as recommended by the United Nations (1977). Dates before 1835 are given according to Old Style (Julian) calendar, and after according to New Style (Gregorian) calendar. New Style was introduced in Serbia 7/20 Dec 1918, formally from 28 Jan 1919. ("By the grace of God and the will of the people, King of Serbia"). Noble Titles: bey, beg = chieftain; conte, graf = count; freiherr = baron; knez, fürst, prinz = prince. Territorial Disputes: Serbia with several other states protest the U.S. and other states' recognition of Kosovo's declaration of its status as a sovereign and independent state in Feb. 2008; ethnic Serbian municipalities along Kosovo's northern border challenge final status of Kosovo-Serbia boundary; several thousand NATO-led Kosovo Force peacekeepers under United Nations Interim Administration Mission in Kosovo authority continue to keep the peace within Kosovo between the ethnic Albanian majority and the Serb minority in Kosovo; Serbia delimited about half of the boundary with Bosnia and Herzegovina, but sections along the Drina River remain in dispute. under Bulgaria) as sanjak of Nish (Niş). Nov 1443 - 1448 Hungarian/Serbian occupation. 24 Sep 1689 - 8 Sep 1690 Austrian occupation. Jul 1737 - 16 Oct 1737 Austrian occupation. 1864 - 1868 Part of Tuna (Danube) vilayet. (briefly part of Novi Pazar vilayet 1871-1872). 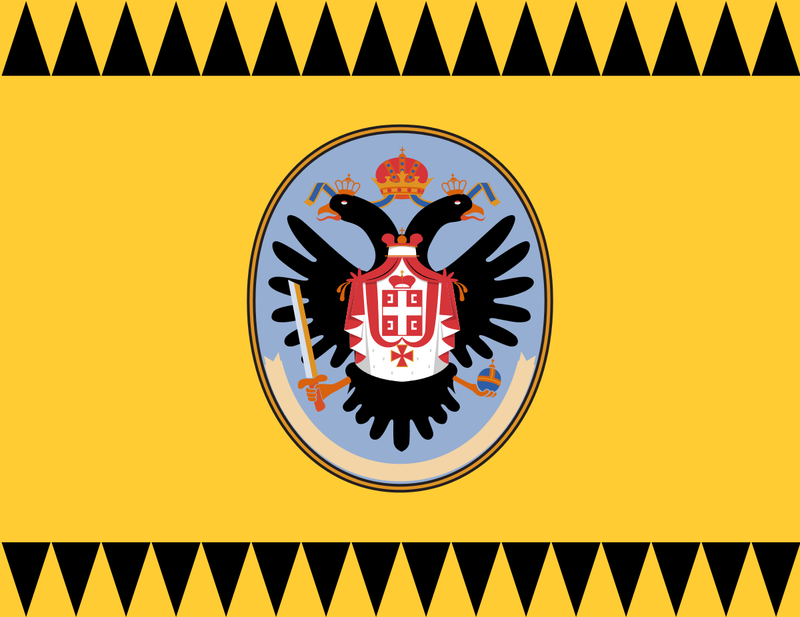 11 Jan 1878 - 13 Jul 1878 Occupied by Serbia. 13 Jul 1878 Annexed by Serbia (as Niš). 1455 Part of Ottoman Empire. 1879 United with the Vilayet of Kosovo. 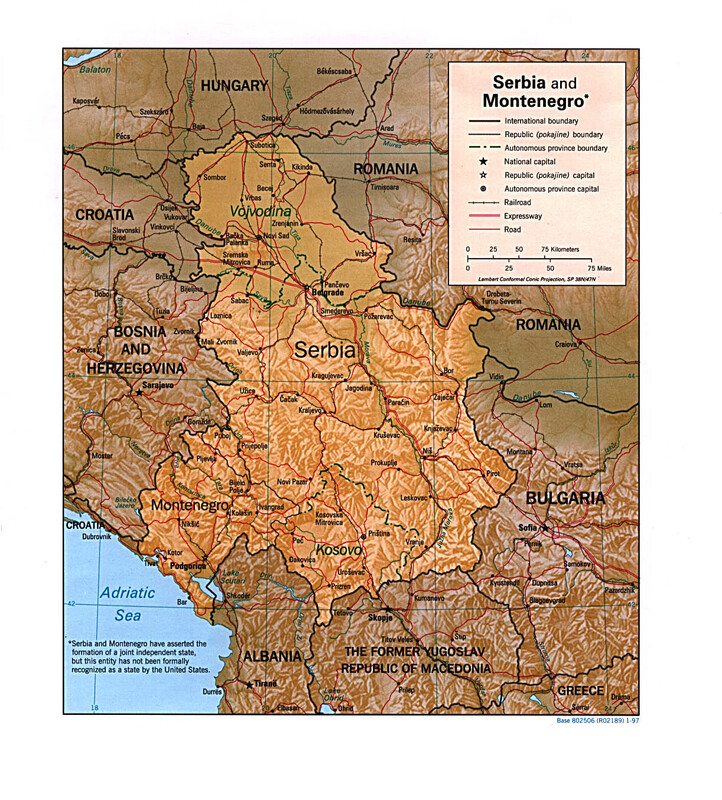 23 Oct 1912 - 30 May 1913 Occupied by Serbia and Montenegro (Pljevlja occupied 29 Oct 1912). 30 May 1913 Partitioned between Serbia and Montenegro by Treaty of London. 17 Apr 1941 - 28 Nov 1944 Under German (and May 1941-Sep 1943 Italian) occupation. occupation and to create an autonomous Sandžak within Yugoslavia. 28 Nov 1944 Partisans liberate Novi Pazar (Pljevlja on 19 Nov 1944). Montenegro (effected 7 Aug 1945). Croatia, Slavonia, and Dalmatia (see Croatia). approved by resolution of the National Council. St. Germain-en-Laye (signed 10 Sep 1919). the Treaty of Trianon (signed 4 Jun 1920). 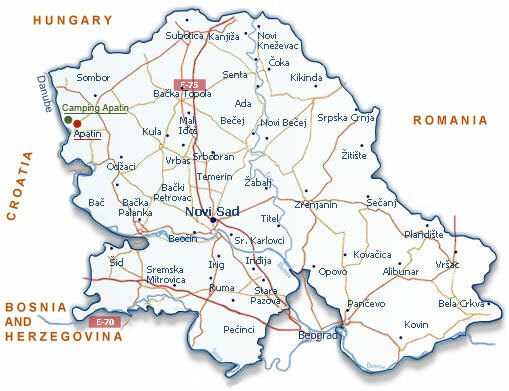 13 Apr 1941 - 20 Oct 1944 Serbia and Banat occupied by Germany (see Serbia). 5 Mar 1945 Accord with royal government. 29 Nov 1945 Federal People's Republic of Yugoslavia. 25 Jun 1991 Independence of Slovenia and Croatia. 17 Sep 1991 Independence of Macedonia. 29 Feb 1992 Independence of Bosnia-Hercegovina. 3 Jun 2006 Montenegro declares independence. a final end to the union. Note: Serbian names are listed (some with notes) using a modified UN (1977) romanization system for Serbian. Dates are given New Style (Gregorian) calendar, New Style was introduced in Yugoslavia 7/20 Dec 1918, formally from 28 Jan 1919. (b) 4 Oct 1929 - 29 Nov 1945: Po milosti Božjoj i volji Narodnoj Kralj Jugoslavije ("By the Grace of God and will of the people, King of Yugoslavia"). (s.a.)(from 16 May 1991), Vasil Tupurkovski (b. 1951), Bogić Bogićević (b. 1953), and Janez Drnovšek (s.a.). On 16 May 1991, Bajramović was elected Coordinator of the Presidency. ³claims the assumption of the presidency on 20 May 1991, retroactively effective from 16 May 1991. Representation of Croatia by Mesić (s.a.) in the presidency formally terminated by the resolution of the Croatian parliament of 5 Dec 1991 (retroactively effective from 8 Oct 1991). 19 May 1998 - 4 Feb 2003. Noble Title: knez = prince. Territorial Disputes (2001-2006): Kosovo remains unresolved and administered by several thousand peacekeepers from the UN Interim Administration Mission in Kosovo (UNMIK) since 1999, with Kosovar Albanians overwhelmingly supporting and Serbian officials opposing Kosovo independence; the international community had agreed to begin a process to determine final status but contingency of solidifying multi-ethnic democracy in Kosovo has not been satisfied; ethnic Albanians in Kosovo refuse demarcation of the boundary with Macedonia in accordance with the 2000 Macedonia-Serbia and Montenegro delimitation agreement; Serbia and Montenegro have delimited about half of the boundary with Bosnia and Herzegovina, but sections along the Drina River remain in dispute. 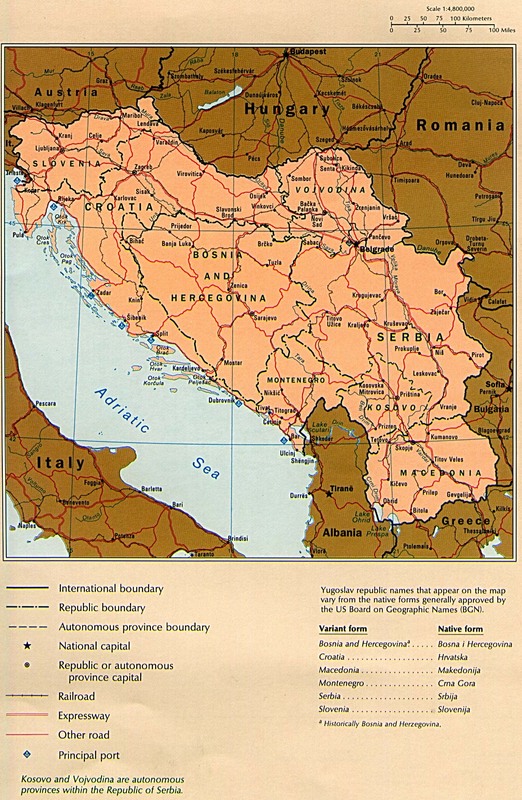 Former Yugoslavia Territorial Disputes: Kosovo question with Albania; until 1993, Macedonia question with Bulgaria and Greece. by Hungary as as a vassal. Aug 1526 Part of the Ottoman Empire (part of Rumelia Eyalet). 2 Nov 1716 - 1779 Part of the Banate of Temesvár (see under Romania). Voivodship of Serbia and Banate of Temesvár (see under Romania). 1 Feb 1861 Re-incorporated into Hungary. Monarchy (i.e. of the "Lands of the Holy Hungarian Crown"). evacuated the city on 8 Nov 1918). to Serbia (with provincial autonomy). Serbs, Croats, and Slovenes (see Yugoslavia). 11 Mar 1919 Provincial autonomy abolished. military administration until 15 Feb 1945). 1 Sep 1945 Autonomous Province of Vojvodina (within Serbia). 26 Dec 1968 Socialist Autonomous Province of Vojvodina (within Serbia). 28 Nov 1990 - 14 Mar 2002 Autonomy rescinded. 28 Sep 1990 Autonomous Province of Vojvodina. 5 Jun 2006 Remains part of independent Serbia. 17 Jun 1941 - 1 Oct 1944 Josef "Sepp" Lapp (b. 1873 - d. 1946) DVSB? Noble Titles: freiherr = baron; graf = count; knez = prince.